Leg and foot pain can originate from other chronic conditions such as lumbar back pain. The nerves that control muscle functions in the legs are located in the lower back, and that’s where symptoms of leg pain can instigate in some cases. 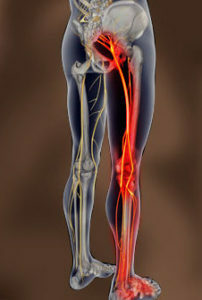 Symptoms of leg pain caused by the lower back conditions can include numbness, tingling, shooting pain, or foot drop. Degeneration in our vertebral spine happens as we age, resulting in lost disc flexibility, and can cause pain to radiate down the leg during movement. Leg and foot pain can be symptoms of lumbar degenerative disc disease, along with the more common symptom of back pain. A compressed nerve could also be the source of leg pain in degenerative disc disease. When the disc degenerates it in a sense shrinks and can reposition itself thus reducing space for the nerve roots, or foraminal stenosis. This can pinch the nerve triggering inflammation that then results in expressions of pain. Most people characterized leg pain caused by a compressed nerve as shooting or sharp pain. Disc herniation can cause radiating pain down the leg from pressure being put on weakened areas of the disc. This pain can radiate down the sciatic nerve and in some cases all the way down into the foot. Other nerves can be affected depending on which disc in the lumbar is herniated. The location of the herniated disc can cause a variation in symptoms a person experiences. Leg pain experienced from most types of herniated discs has a variety of treatment options many are non-surgical. Micro-decompression, is a procedure that removes a portion of the disc allowing the inflamed nerve to heal. In other cases minimally invasive options like self-care, anti-inflammatory medication, or chiropractic care can help reduce leg pain associated with a lumbar herniated disc.